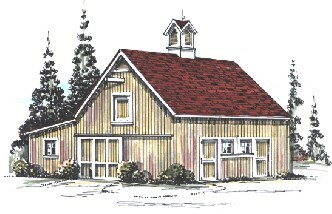 The Chestnut Four-Stall has 10'x12' stalls on both sides of a front-to-back Alley for easy access and cleaning. Enclosed floor area is 720 sq. ft. The loft is 460 sq. ft. Ridge height is 20'-4"